OK, maybe I am a bit a pedant, but saying you are a ‘fan’ of a politician on Facebook is a bit different than saying you ‘Like’ that individual. Yet with Facebook’s change of vocabulary, liking the person is what you’ve got to do and I’m not a fan of the new vocab. 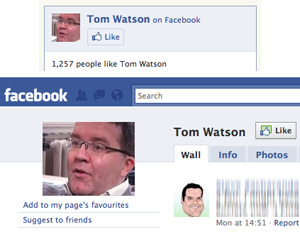 Screenshots from the sidebar of Tom Watson’s blog, and his Facebook page are shown here. An article on Huffington Post explains the changes here, and a further piece tries (rather in vain) to explain what Facebook’s new Community Pages feature is all about. The distinction between Groups and Pages already caused a few headaches, and now the third category… hmm, we’ll see how that works out. Is Blair changing his position on EU taxation? Your point about having to use Facebook despite its flaws because the user base is so big is spot on. I would love to support European web alternatives in order to promote competition in what is essentially a US dominated market. However, what’s the point in trying to launch a social media campaign on Belgium-based Netlog when everyone uses Facebook? There’s a multilingual European version of Twitter called Qaiku – but according to compete.com last year it had as few as 8 hits a day. There’s also a French version of Flickr called Ipernity which is supposed to be very good – but the user base is tiny and it’s nowhere near as supported in terms of widgets and integration. The US has such a lead ahead of Europe in terms of branding, that it’s now pointless trying to catch up. Better to innovate and hope the “next big thing” will reinvigorate the European economy – because we’re now losing our edge in mobile technology.